Meliora served as a subconsultant to Gannett Fleming who led rehabilitation of Cobbs Creek, Ridley Creek and Darby Creek railroad bridges on SEPTA’s Media Elwyn line. 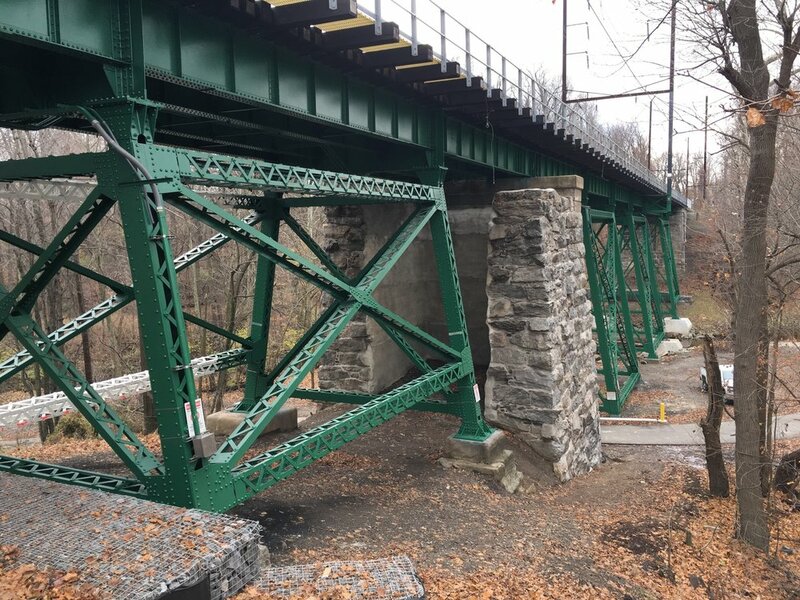 Meliora was responsible for the structural rehabilitation on the Cobbs Creek Bridge including superstructure, towers, rebuilding the abutment back walls and repointing the existing masonry pier and abutments. The Cobbs Creek Bridge is a wrought iron steel multi girder structure, with the abutments and one pier of ashlar masonry, while the remaining piers are wrought iron towers. Meliora provided design services for structural rehabilitation and details to repair corroded and/or cracked members, replace the abutment back walls, bearing pads, sliding surfaces, temporary shoring, and retaining walls, repointing and repairing the ashlar masonry, pressure injecting the concrete pier cap, scour protection for piers near the creek, and regrading to expose buried base plates. Most repairs were completed during weekend outages.